of its cafeteria following feedback from students, parents and school staff. Part of the new setup is a lounge area called Chill Out. 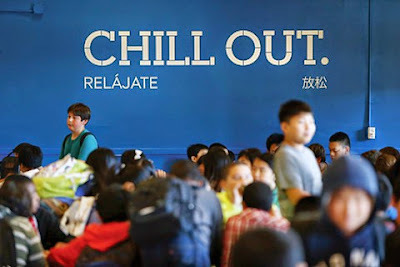 The SFUSD wants to make lunch programs more attractive. Seventh-grade student Alex Luu, 12, surveyed the hot-lunch options before him in the Roosevelt Middle School cafeteria on a recent Wednesday: a hamburger or a bean-and-cheese burrito. He also could have opted for a barbecued-turkey wrap or a salad from the to-go section, but selected the burrito because it "looked much more delicious." And then came a novel question Luu, along with other Roosevelt students, now faces at lunchtime: Where should I sit? For the first time, the students have options beyond simply rectangular tables with stools attached. In the new dining hall, students sit at round tables and chairs, long movable tables and a lounge area with plastic-covered couches and foot rests. The space at Roosevelt reopened Oct. 21 after undergoing a monthslong renovation as part of a pilot project tied to the San Francisco Unified School District's overall food-service transformation. The space, about 25 percent bigger and boasting modern decor, looks more like San Francisco's hottest new restaurant than a school cafeteria. "It's much more state-of-the-art, it's all new and we have the new cushions," Luu said of the lounge area. "Regardless of wherever I sit, I still like it because it's more decorative and much more colorful."